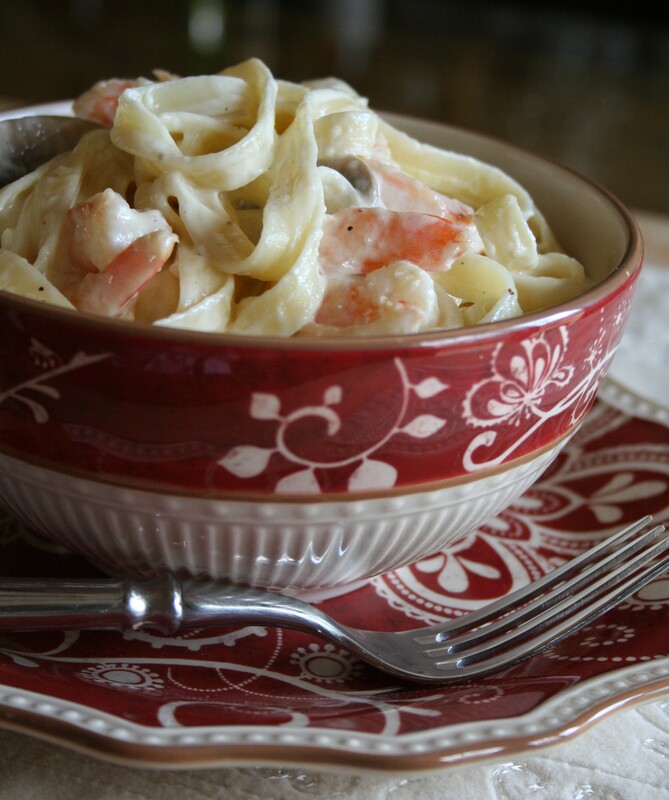 This dish looks so elegant on the table that no one will believe how easy it was to make. I often serve it at dinner parties with steaks or roasts. Preheat the oven to 375 degrees. Lightly grease a 9- x 13-inch baking dish with butter and set aside. In a large saucepot combine the milk, cream, butter, garlic, and nutmeg. Peel the potatoes and cut into slices about 1/8-inch thick. Add the potato slices to the milk mixture to prevent discoloration. Over medium-high heat, bring the milk mixture to a simmer and cook until the potatoes are slightly tender but still firm, about 5 minutes. Season with salt and pepper to taste. 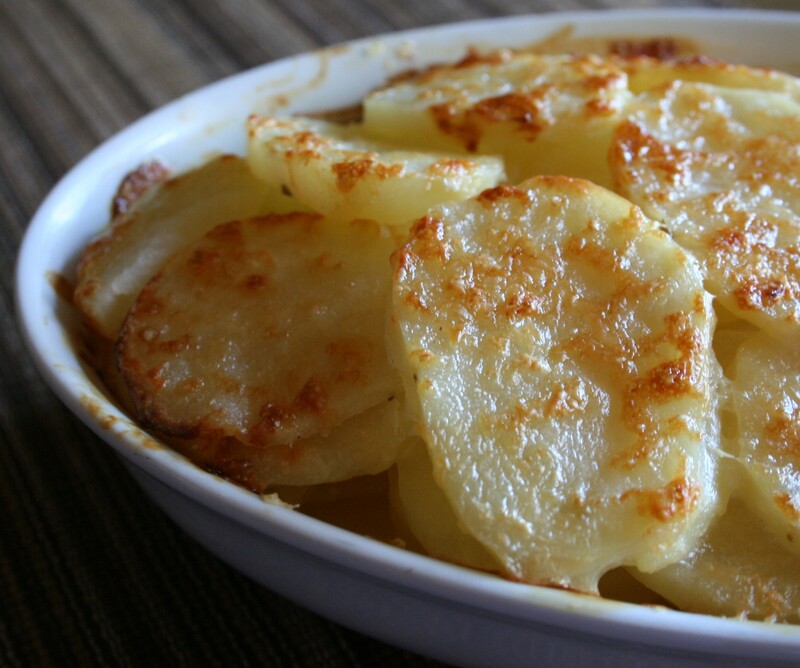 Using a slotted spoon, transfer the potatoes to the prepared baking dish, arranging the top layer of the potatoes in an overlapping pattern, if desired. Add the Dijon and mustard and stir to combine. Pour the milk mixture over the potatoes. 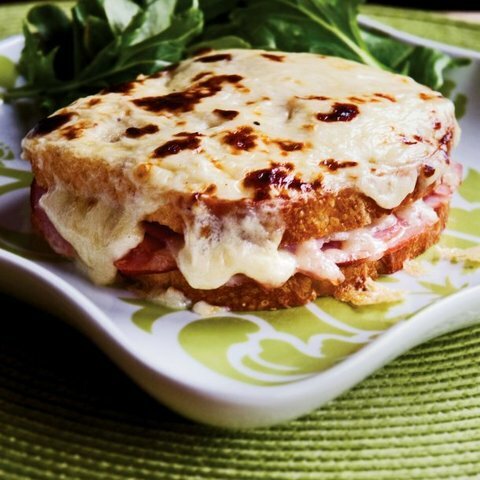 Sprinkle the Gruyere cheese evenly over the top. Cover the dish with a buttered piece of aluminum foil, buttered side down. Bake until the potatoes are fork tender, about 30 minutes. Remove the foil and bake until the potatoes are golden brown, about 20 minutes. Cooking Tip: The difference between freshly grated nutmeg and commercially ground is night and day. To grate whole nutmeg, use a special nutmeg grater or scrape the seed over the finest rasps of your box grater. I buy my whole nutmeg at the grocery in a specially designed jar with a grinder built into the lid. 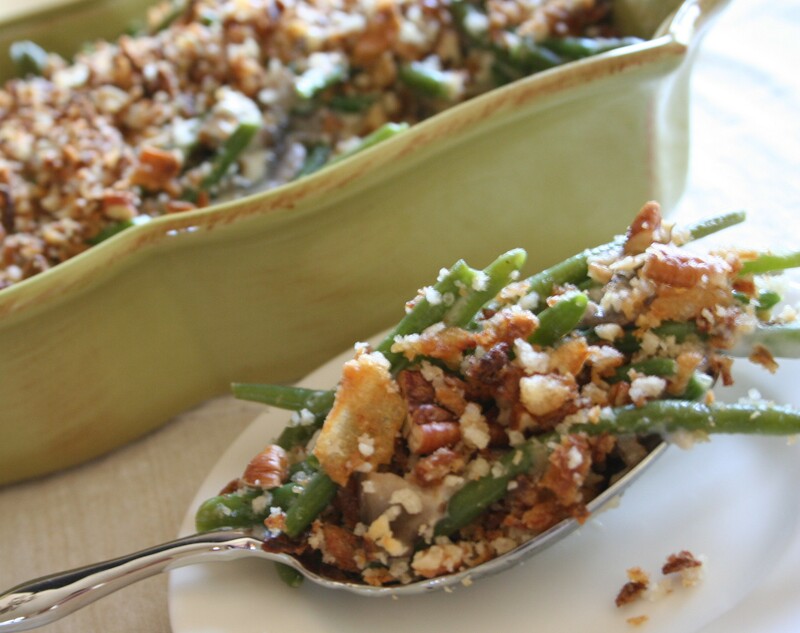 Did you know it’s the 55th anniversary of the Green Bean Casserole?! It’s an iconic dish that most Americans expect on their holiday table. Originally made with canned green beans and condensed cream of mushroom soup, I took the basic elements of this classic dish and gave it a fresher, modern spin. Lastly, I tossed chopped pecans and panko bread crumbs with the classic French’s French Fried Onions for a crunchy topping that makes the dish in my opinion. Cooking Tip: What are haricots verts? Quite simply, they are very small and slender French green beans. (Haricot verts is French for green beans.) 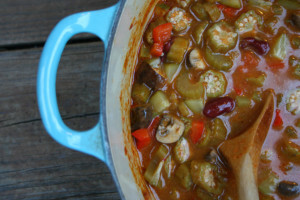 They tend to be more tender and flavorful than the thicker American green beans. Most markets now carry them both fresh and frozen. American green beans, fresh or frozen, are an acceptable substitute. When my friend Laurie Major told me about her grandmother’s peach cobbler I just had to give it a try. Mrs. Mohler made it with 3 layers of crust! I am all about the crust, but am a little lazy at times. I have made this into a double-decker cobbler. But if you have an extra 10 or 15 minutes, you can add that third layer of pastry. I hope you enjoy it as much as I did. I thought it was so good I included it in my new cookbook Simply Suppers! Preheat the oven to 400 degrees. Lightly grease a 2-quart baking dish with butter and set aside. In a large saucepot over medium heat, melt the butter. Add 3/4 cup of the sugar and water and cook, stirring, until the sugar is dissolved. Add the peaches, lemon juice, bourbon, 2 teaspoons of the cinnamon, nutmeg, and salt. Cook, stirring occasionally, until the flavors have melded, about 5 minutes. Add the flour, stir to coat, and cook until the sauce is slightly thickened, about 2 to 3 minutes. Evenly spoon 1/2 of the filling into the prepared dish. Top with a layer of pie crust. Bake until lightly browned, about 15 minutes. Remove from the oven and spoon the remaining 1/2 of the filling evenly over the crust. Top with the second pie crust. Brush the top crust with the beaten egg. Evenly sprinkle the remaining 1/4 cup of the sugar and the remaining 1 teaspoon of the cinnamon over the top. Bake until the crust is golden brown and the filling is bubbly, about 18 to 20 minutes. Serve warm, with a scoop of vanilla ice cream, if desired. Cooking Tip: To make the third layer, place a pie crust on the bottom of the pan. Par-bake the bottom crust for 10 minutes. Then layer as directed in the recipe above. Time-Saving Tip: I love fresh peaches, but they can be a hassle to peel. 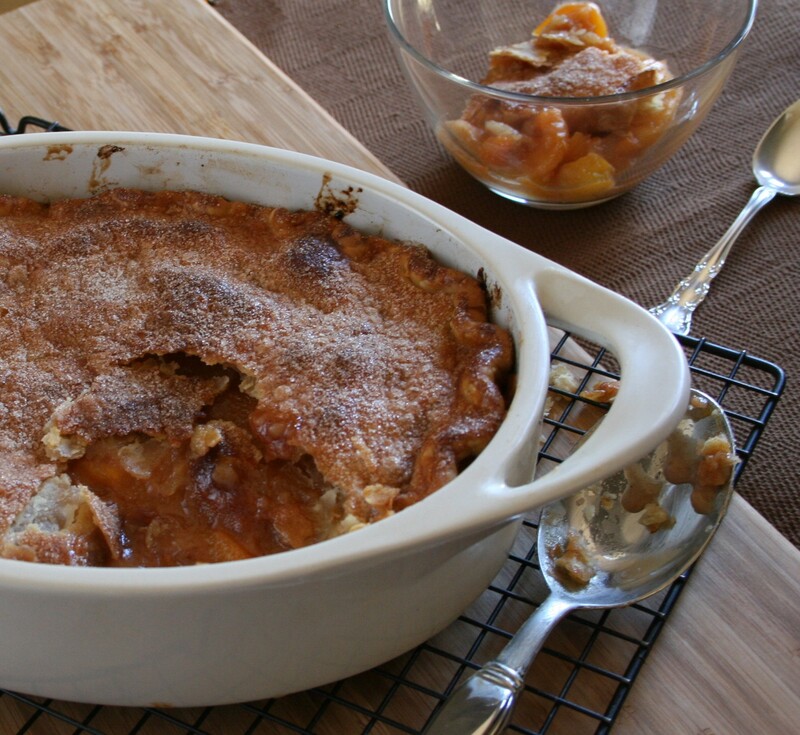 Frozen peaches are in-season year-round and work just as well in this dish…without the extra work!